by Rob - December 14th, 2016. Okay, look, I know I’m supposed to say I loved the movie Arrival, but, um, well, I admired it, but, my God, new rule: no one who liked Arrival is ever allowed to complain that Star Trek: The Motion Picture was slow-paced again. A different director could have executed Arrival‘s entire screenplay without dropping a single scene or line of dialog in half the running time. 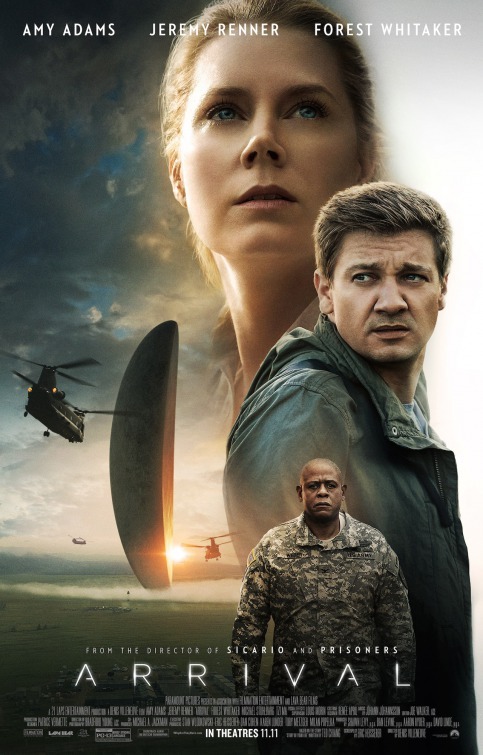 And although Amy Adams is fine and appealing in her lead role, Jeremy Renner is just irritating in a lacklustre part, and the awesome Forest Whitaker’s talents are utterly wasted in a one-dimensional role anyone could have played. We need to decode an alien language, so we’ll try our very best linguists one at a time, and bring in, oh, let’s say, um, how about precisely one physicist, too, just for shits and giggles? Seriously, Whitaker’s character says Amy was better than the last guy, and had threatened to go on to the next guy if she didn’t want the job when trying to recruit her. They would have gotten all the top linguists and all the top physicists at once to try to crack this. Also, come on, the giant alien ships arrive right over the city of Shanghai (and other cities), but we never see any of the chaos that would cause — and instead, inexplicably, the alien ship we do follow is the one in the wilds of Montana, where access can be contained, and public reaction completely ignored. Sure, that’s the American team, so we’re supposed to be rooting for them, but only the American team could have put up a military cordon around their ship — vastly simplifying the storytelling (in the way having only one expert on each topic did) but hardly telling the most-interesting version of the story. So, yeah: intelligent, sure. Thoughtful, even. But languorous and visually dull in terms of cinematography and special effects (it’ll play fine on DVD). I’m going to re-read Ted Chiang’s original novella soon, as well as the screenplay (which has been provided to WGA members for awards consideration). Maybe because so many people said the loved, loved, loved this movie, my expectations were unreasonably high, but I’ll take Interstellar over Arrival any day. It’s often been said that science fiction works best at shorter lengths. Proving that maxim better than anyone in recent history is Ted Chiang. He’s never published a novel, and only has eight short stories to his credit — but what short stories! His first — 1990’s “Tower of Babel” — won him the Nebula Award, the SF equivalent of an Oscar. His most recent — 2001’s “Hell is the Absence of God” — got him a Hugo, SF’s people’s choice award. Chiang’s entire oeuvre is collected in Stories of Your Life (Tor Books, Cdn$34.95). Chiang is a consummate stylist, and these lyrical tales aren’t just great SF; they’re great literature. As with most of my blog posts, I also posted this one on Facebook. As usual, the comment thread ends up being mostly over there, but anyone can see and participate in it; my Facebook wall is public. The thread is here HERE.